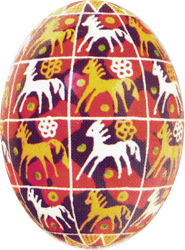 The stag and the horse are both sun symbols, and can be found on pysanky from the Hutsul regions. 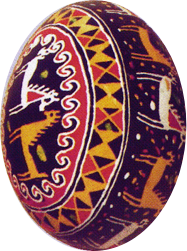 In ancient Ukrainian mythology, it was believed that the sun remained underground at night, and that the stag carried it up into the heavens on its antlers every morning. In later times, these beliefs were carried over to horses, and it was said that the sun traveled across the sky in a chariot drawn by fiery horses. Dazhboh was the ancient god of the sun, and these horses were his steeds. 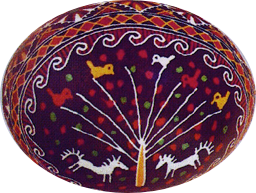 In national folk culture, according to Ivan Denysiuk, the horse is a symbol of speed, endurance, the freedom of the steppes, and of loyalty and devotion. “With his inseparable twin, the knight (lytsar) or kozak overcame the boundless steppes. In Ukrainian folk songs the horse has the chivalrous nature. He saves his rider in battle, celebrates his successes and mourns his failures, even punishes his master for immorality, and when his master dies, digs a tomb for him with his hooves tomb and runs to inform his parents about the death of their son. It's almost a sacred animal." 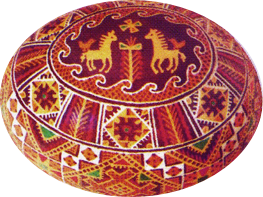 Horse motifs, like deer/stag motifs, are found primarily among the Hutsuls. 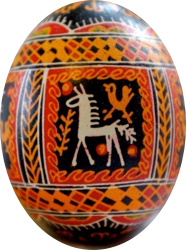 Horse motifs have become fairly popular in recent years among the pysankarky of Kosmach, where many of the pysanky sold at Easter markets and further abroad come from. (It is a local industry.) 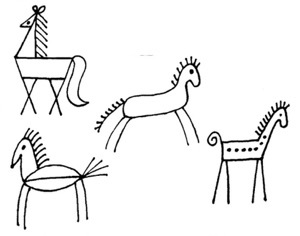 Horses, like other animals, ar shown in an abstracted form, and unlike many, in their entirety. They can be identified by their characteristic mane and tail. 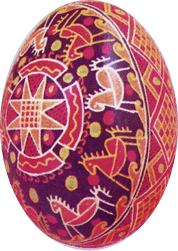 Below are older examples of of horse motif pysanky from the Hutsul region (left, Olena Kulchytska; right, Binyashevsky). 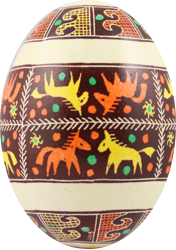 The horses on these pysanky seem to be prancing or running, their manes flowing out behind them. 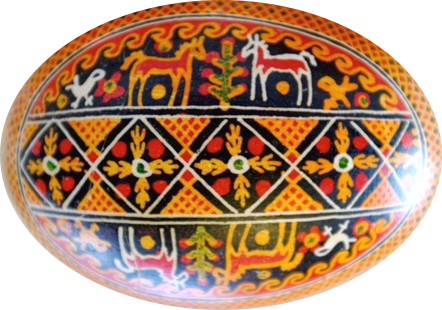 Horse motifs on pysanky seem to follow many of the same conventions as do deer/stag motifs. 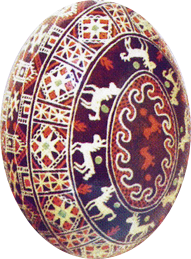 They are most commonly seen on Hutsul pysanky. 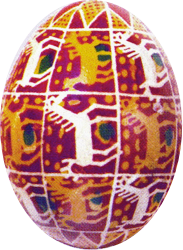 Below are two such pysanky collected by Olena Kulchytska in the early 20th century. These particular horses seem to be at rest. 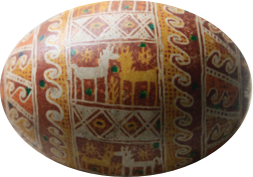 Here are two examples from Elyjiw of diasporan pysanky with horse motifs. 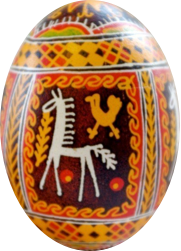 For some reason, like deer, horses are often pictured on Hutsul pysanky with birds near or on them. I do not know why this is so. 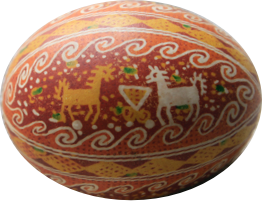 You can see this on these Hutsul pysanky from Elyjiw. 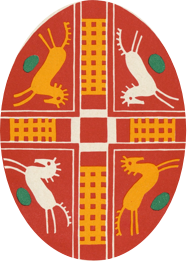 Horse motifs are thought to have a two-fold meaning. On the one hand, the old meaning is that of a sun symbol. 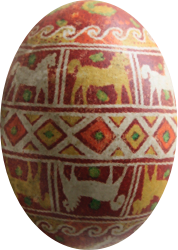 On the other hand, horses are farm animals upon which a family depends; horse motif probably serve the additional talismanic purpose of ensuring the health and fertility of a family’s horses. Back to Zoomorphic Gallery page.